LEAP DAY... | A.B.E. Remodeling, INC.
We just want to give a shout out on behalf of Leap Day. HAVE A LEAPING GOOD TIME TODAY. And for any birthday babies... Have a hoppy one!! For a day that is celebrated only once every 4 years on February 29th (with some mathematical exceptions we'll go over later) it sure seems to have a lot going on around it. Leap year has devious explorers, beloved saints, partying boarder towns and proposal popping Irish ladies. And let's not forget all the birthdays babies. They do have some making up to do on the celebrating, you know! Since the beginning of time, man has been improving the way we keep it. That applies to calendars as well. Early Egyptians had a leap year in their calendar. The early Roman calendar had entire leap month from time to time to keep the days in line with the astronomical year. It was Julius Caesar and astronomer Sosigenes who revamped the Roman calendar giving it 12 months with equally (almost) distributed days and adding a leap day every 4 years. In 1582, Pope Gregory XIII adjusted the calendar once again. Because the Earth revolves around the sun once every 365.2421 days, one leap day every 4 years is just slightly too much. Instead of shortening the leap day, the Gregorian calendar is designed such that leap days only happen every 4 years except years evenly divisible by 100 but not 400. There was not a leap day in 1900 and there will not be one in 2100. So a baby born on February 29, 2096 will be in the 3rd grade on his 1st birthday! And even this adjustment doesn't keep the days perfectly aligned with the seasons. Those humans who are still around in 10,000 years will have to address those issues. It's truly not a leap day concern. 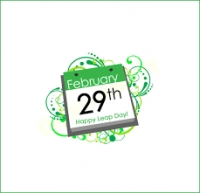 For more information, visit the National Day Calendar page for National Leap Day.